The following article on Old Bayview Cemetery is the work of R.W. Holt. He is an artist, photographer and freelance writer based in Huntsville, Alabama, who grew up between Georgia and Texas calling Austin his second home. 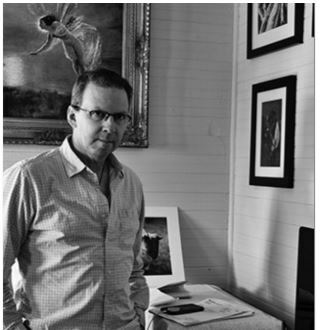 Through All Aspects Photography he routinely photographs and documents lost and forgotten cemeteries and places of historical interest throughout North Alabama, Mississippi and Tennessee. Shooting film and Wet Plate Collodion, he is also an active practitioner of many alternative process photographic printing processes. Through an online blog and YouTube channel he is actively spreading the gospel of the photographic arts. All photographs in this article are the work of Robert W. Holt. Texas is without argument one of the proudest states in the union. The story of Texas is remarkably complex and unfolded over a long period of time. Texas was its own Republic for crying out loud! In many ways the rise of Texas was the result of forces which it did not own. The westward expansion of European immigrants and Eastern Americans, the Spanish, the Mexicans, Native Americans, the Civil War all are just examples of key ingredients in the caldron within which Texas was brewed. Stories abound of individuals and groups, struggles, tragedies and victories. Texas was not easy for, or on, anybody but it produced a legacy of strength, courage, perseverance and pride. Texas created legends. Texas pride is legendary. Texans have a lot to be proud of and tend to be fiendishly defensive of their rich and diverse history. It is a state where the inhabitants overtly pronounce their pride both as Texans and as Americans. To be a Texan is to be something unique and there is a feeling that goes along with that. I do not need to argue the point that this pride is something that more and more stands out in stark contrast to our high tech, “its all about me,” nation where we continuously bear witness to a growing antipathy and even disrespect for our history. Been to an NFL game lately? Sat with a gaggle of hipster millennials in a farm-to-table fair-trade coffee-brewhouse-retro-market-bar lately? Yawn! That Texans take great pride in themselves and their history can be seen in just about all aspects of Texas culture. It is in no way more evident than when it comes to the way they treat historical places. Whether a piece of architecture or a plot of land, Texans revere and mark these material elements of their history with fervor. From the Alamo and Adobe Walls to the State Capital and historic ranches, Texans protect and remember their history. Remember the Alamo! This holds true for historical figures as well. Houston, Austin, Baylor, Bowie, Crockett, King, and Hood just start the long list. Yes, Texans remember their history and they remember their dead. Well, most Texans do that is. 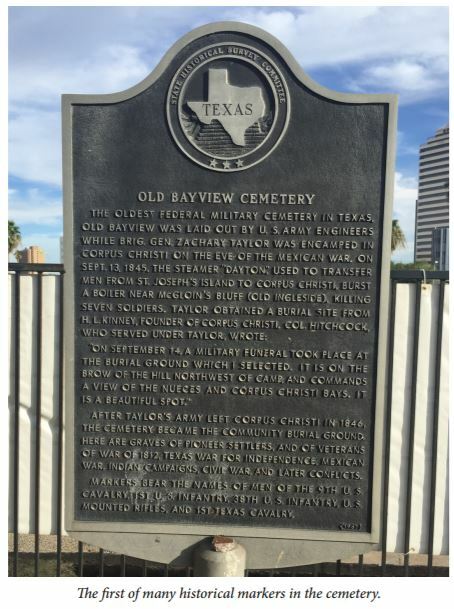 Deep in the heart of Texas, in the town of Corpus Christi lies Old Bayview cemetery. Ever heard of it? Didn’t think so. You are not really going to stumble upon Old Bayview whilst strolling through the touristy areas of Corpus Christi. It’s off the beaten path a bit. It’s probably more accurate to say that the beaten path has moved away from the cemetery over the years leaving it alone in deep urban shadows. Stepping into Old Bayview, at first glance you’re left with the impression that you’re standing amidst the aftermath of an air raid. It is more ruins than cemetery. The listing and toppled masses of gravestones amidst shattered sites with bits and pieces strewn about brings to mind the bombing of Berlin or the Battle of Britain. It’s wreckage pure and simple. In fact it is a struggle to find an intact grave site. Walking through the cemetery, from site to site, is when you begin to come to terms with the destruction and the dire state of the cemetery as a whole. 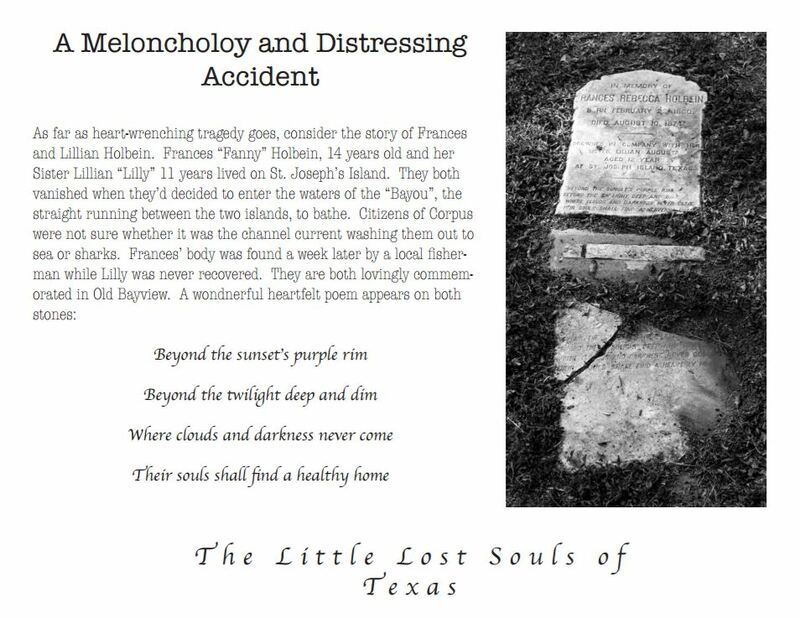 Even in the open grassy areas the odds are with you that you’ll feel something under foot and upon inspection discover a piece of a headstone or even one in its entirety fully encased under grass and dirt. Within minutes you will begin to wonder what the heck is going on. You will ask yourself how can this be. But wait….it gets worse! You see, amidst all of this rubble reside no less than half a dozen historical markers each covering in extensive detail the history of the cemetery as a whole and then specific grave sites. This is when the real smack to the face comes. I promise you, reading these words whilst looking out over the wreckage will immediately cause you to pinch yourself because you’ll surely feel you must be dreaming. What will happen next is that you will turn from this first sign, look back over your shoulder at the cemetery, return to the sign rereading parts of it to make sure that what you thought you read is in fact what you’ve read. Again you’ll look back over your shoulder at the cemetery and finally you’ll start to feel something welling up inside you. Don’t be alarmed. What you’re feeling is a sour cocktail of shame, anger and confusion. Looking past the sign from the edge of the “brow of the hill” and you’re looking out over the city of Corpus Christi. From this “beautiful spot” you’re left to wonder how on earth this all adds up. You’ll then continue on your self guided tour with words like Pioneer Settlers, Rangers, Texas Republic and Veterans running through your head. In a state of mild disbelief you will feel extremely compelled to inspect each grave, all of it’s remaining pieces and parts, in detail. This will be no small task and you’ll quickly discover that you’re missing many pieces to the puzzle. You’ll then sink into dismay. Yes, it gets worse still. You see, the Old Bayview Cemetery historical marker is an incredible understatement. It merely tickles the surface with regards to the real scope and significance of the history contained within the cemetery. Let’s hit some of the highlights. The first thing you should note is that if you’re standing in Old Bayview Cemetery, you’re standing in the south. Yes, it matters. You see there are no “sections” in Old Bayview. Unlike just about every cemetery you’ll find from this period in time, in the South, it is a fully integrated cemetery. From anglo settlers to Mexicans, former Slaves and Buffalo Soldiers, all occupants share equally in their rest upon this “beautiful spot” on the “brow of the hill.” So, not only is this cemetery substantial in terms of the breadth of history it offers, its’ diversity takes that great breadth and enriches it yielding a more complete historical offering. The next thing to contemplate is the fact that this is the oldest military cemetery in Texas. Surely, and I’m not sure, it must rank as one of the older military cemeteries in our nation. From Texas Rangers and those who fell in defense of the Republic of Texas to service personnel earlier and later, the span of military military history represented is unparalleled until you step into places like Arlington National Cemetery. This is a military cemetery of significant proportion covering not just Corpus Christi history, not just Texas history but American history. It is when you start to absorb the stories of the “pioneer settlers” that the full magnitude and significance of Old Bayview comes into complete perspective. As noted on the marker, after the Army departed, “the cemetery became the community burial ground.” What a stroke of luck! The stories that every single one of these civilian graves offers up, when taken in combination with the military graves, produces a vivid historical picture of life and times, a true historical record. With origins ranging from all parts of Britain, Europe and Mexico you will move through travail, turmoil, tragedy and triumph. Let us return to the fact that Old Bayview is a diverse resting place treating all of its inhabitants on an equal basis. This is irrefutably true when you understand its history and consider it’s composition. Unfortunately, it is also equally true today when it comes to the disrespect, destruction and failure to preserve and protect. Military heroes, sheriff ’s, immigrants, former slaves, Mexicans, Anglos and children, yes children, have all met with the same fate. So, what’s the deal then? Well, let’s be straight about a couple things. What you’ll see at Old Bayview is destruction plain and simple. No two ways about it! The willful defacement and destruction of a local, State and National treasure by humans. We’re not talking negligence, yet, we’re talking maliciousness. You’ll see disrespect for humanity and history on a grand scale. You’d have to look far and wide to see anything comparable to what you’ll find in Old Bayview. To make matters worse, the destruction is still occurring. There is a truly sick and disturbing element at work here. You will find gross negligence and antipathy. The plain truth is that this destructive activity has happened and continues to happen because it is allowed to. It needs to be said, and even more to the point, measures are not in place to preserve, protect and sustain Old Bayview. While this is of State and National concern the cemetery belongs to the town and while it’s all too easy to blame “the Government” let’s be clear, the Government of Corpus Christi is comprised of elected officials and they’re spending the money of the very people who elected them. If enough people cared, well, it would not be that difficult to get the politicians moving. The reality is, obviously, people do not care. They do not care about their history, Texas history or American history. Even more, they do not care about respecting the dead and respecting the deeply heartfelt commemoration that has gone into each burial site. The blindness of the citizenry of Corpus Christi to what has been entrusted into their safe keeping with Old Bayview has resulted in the cemetery not only failing to be heralded the prize possession it surely is but its being relegated to no-priority status and thereby failing to receive the attention and resources necessary to preserve, protect and sustain it. I’m calling a spade a spade here. This is shameful. Wait, it could get a little better. Over the past dozen years a small band of Corpus Christi locals have at personal time and expense dedicated themselves to efforts to protect the cemetery. Protection seemed the first logical step and I agree. Basic maintenance in the form of grass cutting, the installation of an ineffective fence and even pleading with the town to more favorably place street lamps were all meager but essential first steps. Through their efforts things have improved a bit and a drip of resources have made their way torwards this national treasure. All the while this group has worked with the county historical commission and others to try and raise public awareness. So far, not so good. Working with the town library a website was established and an effort was made to move through the cemetery photographing, documenting and essentially cataloging as many of the occupants as possible. All of this is publicly available on the main Library’s website. A survey of the cemetery was conducted using ground penetrating radar and this went a long way in terms of allowing for the identification of unmarked burial sites. These efforts are to be applauded. The digital record is essential. All said and done, it is a strange and confounding problem that Old Bayview presents. Strange in that of all the places in the United States that you’d least expect to see history so disrespected and neglected, Texas would be at the top of the list. Perhaps it is truly and simply mass ignorance about Old Bayview altogether? Well, that’d be a bit easy. Truth is, the Government of Corpus Christi and the County of Nueces know all that is to be known about Old Bayview. That’s a fact. As for the scourge of willful human destructors? Well, I don’t think that Corpus Christi is alone there. That they allow this to occur against a precious heritage is alarming. Everything is big in Texas? Well, shame is big in Old Bayview. What was that saying again? Oh, that’s right…..DON’T MESS WITH TEXAS!